Wreaths, wreaths everywhere. I've even done posts just spotlighting wreaths! Sometimes, I just want something different to hang on my front door. 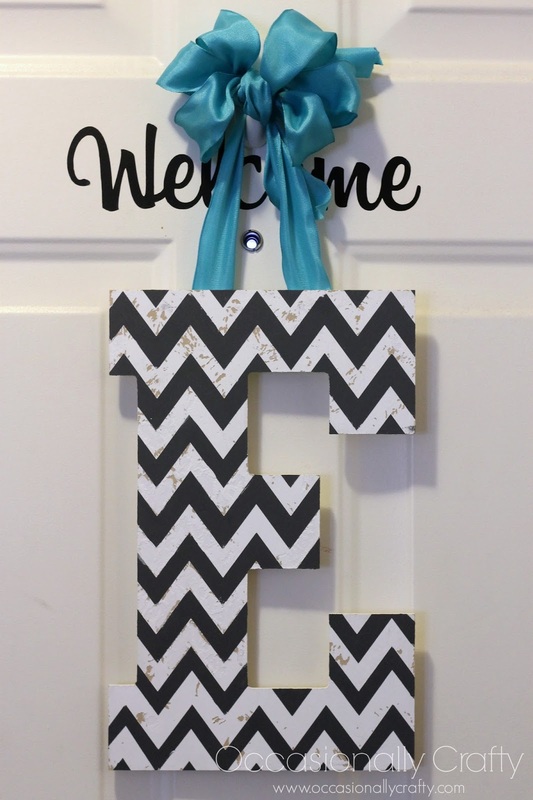 So, I decided to make myself a cute letter to hang up instead. 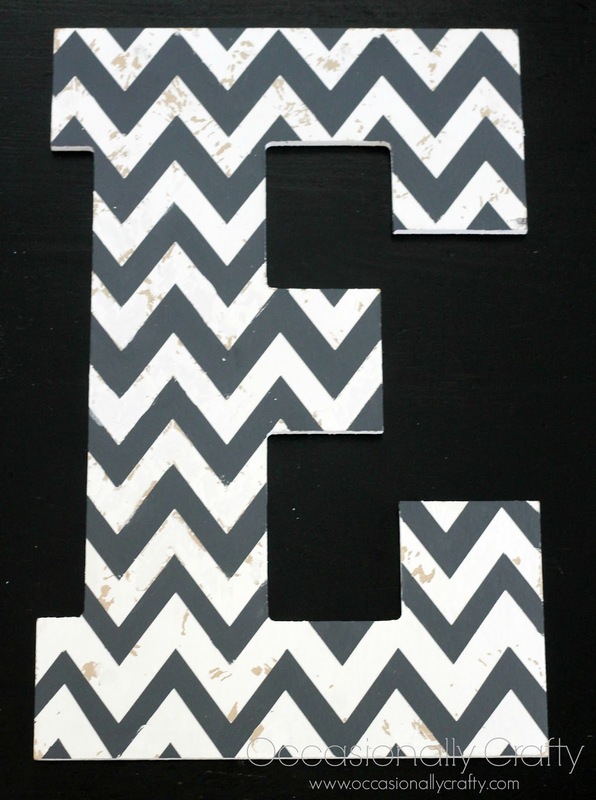 Long ago a pinned a chevron letter on Pinterest, but I can't find it, or maybe I just liked it but didn't pin. Anyway- it was time to finally make what I've been coveting. So I picked up my supplies at Michaels- and if you want to make one, you'll need them too. 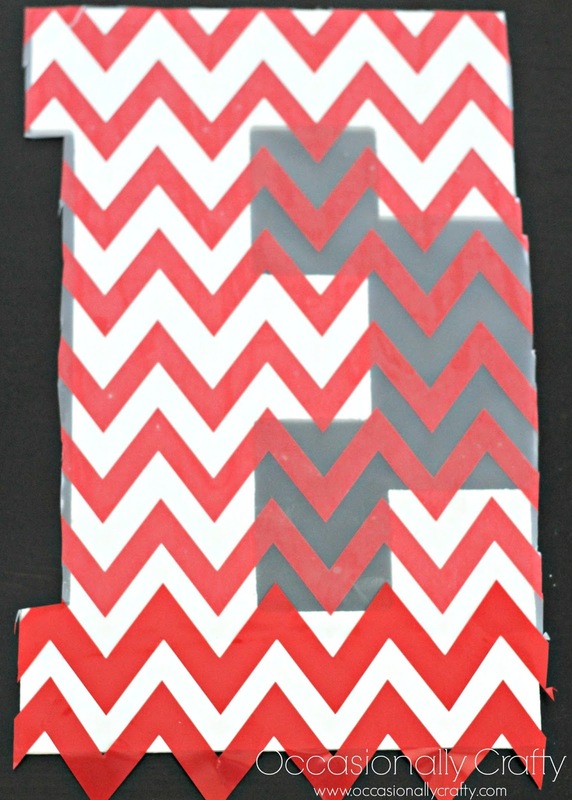 Here is your supply list: Wooden or MDF letter Vinyl/Transfer Tape (or contact paper) Paint/ Paintbrush Fine Sandpaper Wide Wired Ribbon Staple Gun or Glue for Hanger ***Note*** If you don't have a craft cutter but still want a Chevron design, I have heard that there is Chevron painter's tape out there, or you could buy a Chevron stencil. 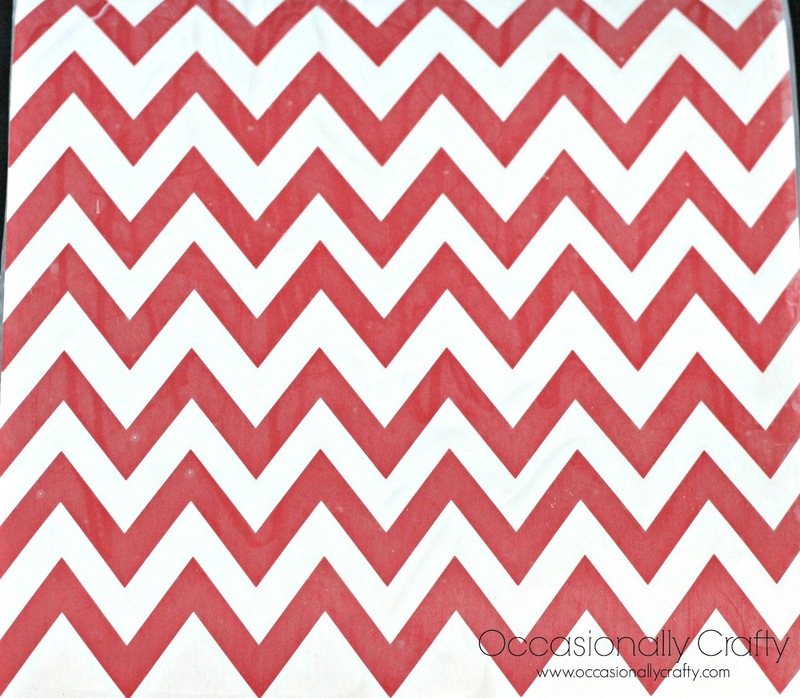 *** First things first- I fired up my Cameo, took a chevron border, and sized it/ replicated it to make a whole sheet of chevron vinyl. I did keep the lines I weeded out, as my letter was slightly taller than the 12x12 sheet I cut. Oops. 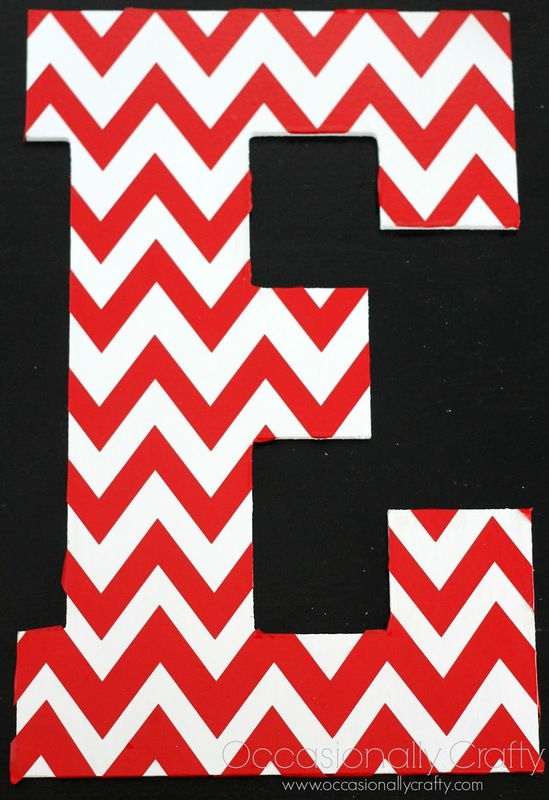 I prepared my letter by painting it the base coat, or the color I wanted the area under the red vinyl to be. Make sure you let this completely dry! I'll show you why in a minute. When it is dry, I applied the vinyl using transfer tape, then cut it down as close to the letter as possible. You'll notice I had to add two extra zig zags at the bottom. Don't do what I did- just cut a longer sheet of vinyl from the beginning. I removed the transfer tape and made sure the vinyl was firmly attached to the letter. This next step is super important for clear, clean lines. I painted over the edges of the vinyl (or stencil) in the base coat that I already used. That way, if anything was going to bleed under your stencil, it would be the base coat. Now I was ready to paint my second color in between the vinyl stencil. Start lightly- it's better to do a few light coats rather than one heavy coat. I let the paint dry, then peeled up the vinyl I used as a stencil. Then, I wanted to cry! Now you'll see why it was so important to let your base coat dry. I thought I did, but obviously I didn't! When I pulled up my vinyl, half of my base coat came up with it! If this happens, you've got twp options. 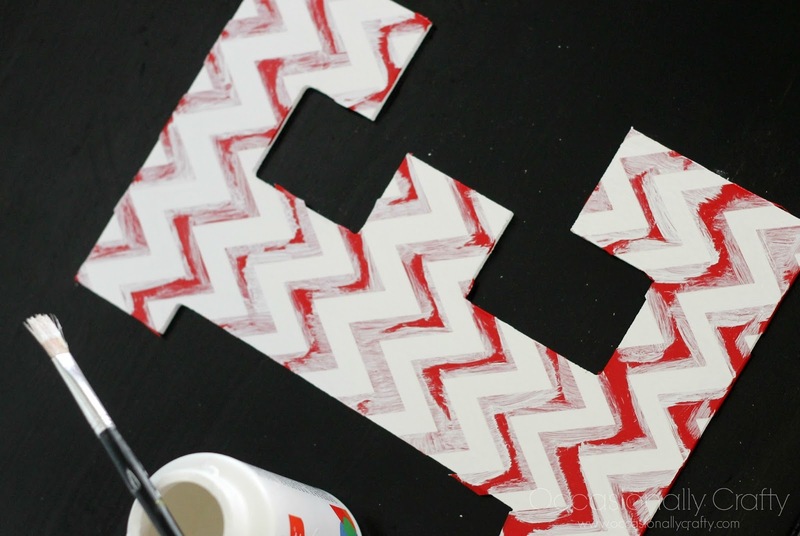 1- Chuck it in the trash and start again or 2- Get out a small brush and carefully paint in the most noticeable parts. Please give #2 a try before you do #1! I decided to paint in all the big gaps where paint was missing, but I kept a lot of the smaller "scratches", since I was planning on age-ing it a little with sandpaper anyway. Go over the whole thing with sandpaper and, if desired, a clear coat of sealer. Attach a hanger by tying wired ribbon in a triple bow, or whatever kind of bow you desire. 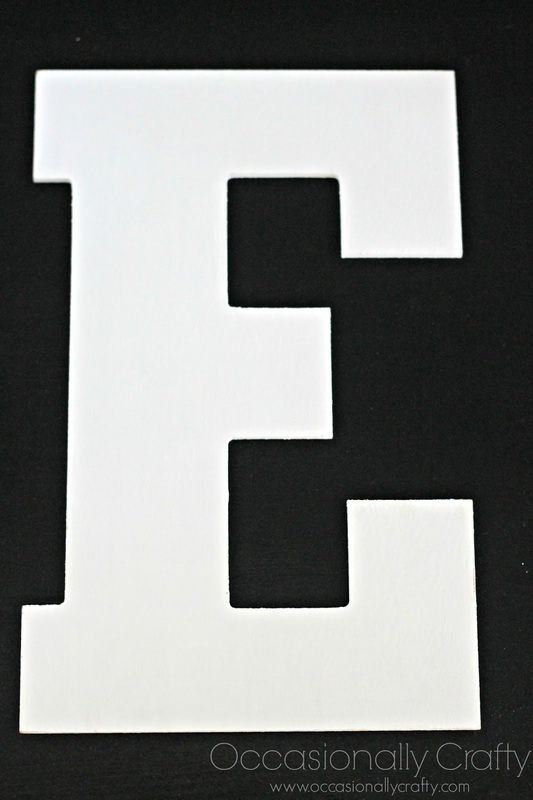 I attached mine to the back of my letter with a staple gun, but you could use a strong glue as well. Just let it dry before you hang it! 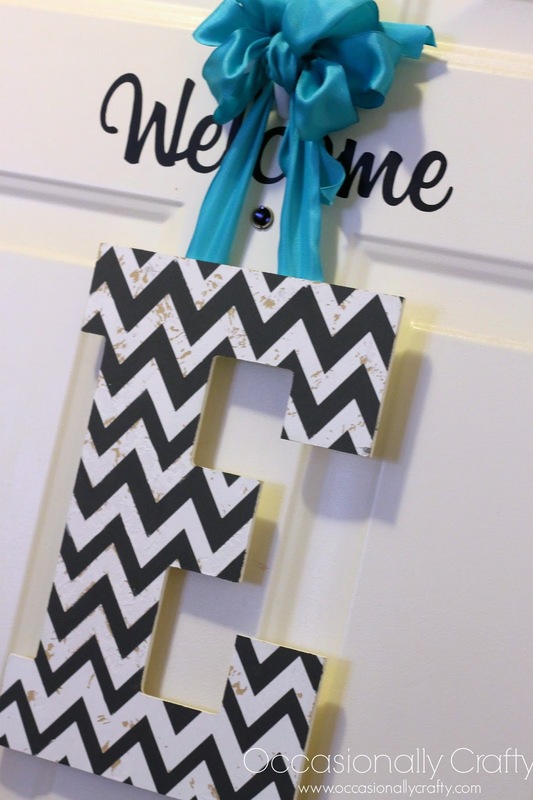 And now you have a cute letter to hang on your door! P.S. I'm linking up at some of these fabulous parties this week. Come check them out with me! That came out really nice, great job on it. I want to put something on my front door but I also have a security screen door so not sure what to do. Susana- you could use a wreath hanger if you have a gap, or there are hooks made especially for security/storm doors. I just hang stuff on the inside of my front door, except for Christmas time. I think the stripped base coat gives it some weathered character which contrasts well with the black paint. I am not much of a paint person but I think I could do this too. Thank you for the tutorial! 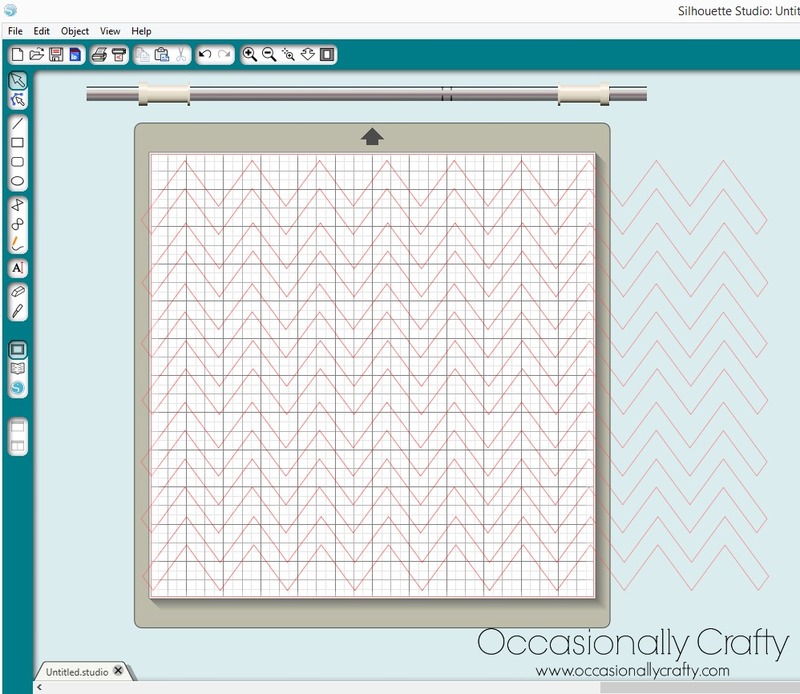 I just discovered your blog today and have absolutely loved reading your projects. Donna- thanks for taking some time to look around our blog! I appreciate you taking the time to comment. 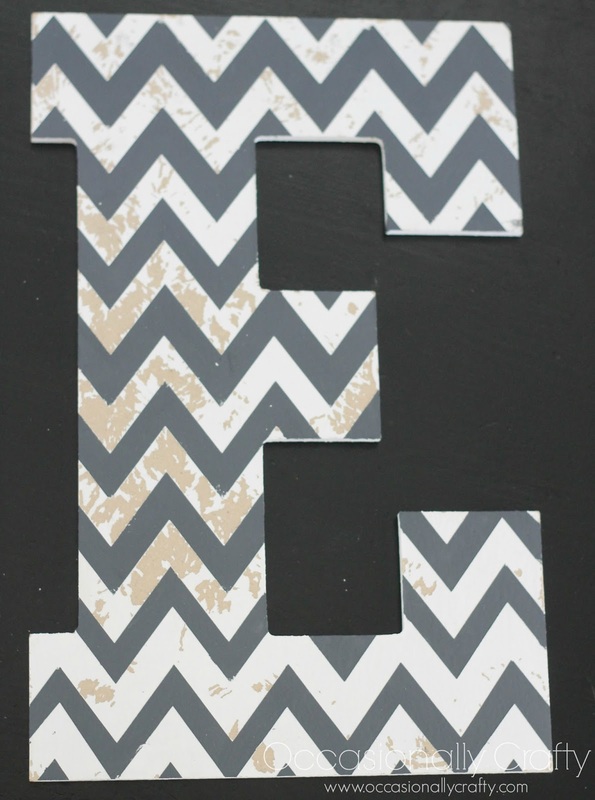 Yes, painting the edges of the stencil makes a huge difference (or you could use matte Mod Podge). I hope it's helpful for you! "See" you around soon!